I’ve noticed over the past year of learning the ropes of blogland that many bloggers choose to protect the privacy of their loved ones by either referring to them with an initial or giving them some sort of pseudonym. By this logic, my fiance would become “[N]” or perhaps even “Mr. Crafter.” If you know “[N]” at all, you are no doubt doubled over laughing at the thought of him ever being referred to as “Mr. Crafter.” Having his privacy protected, on the other hand, is very much up his alley. That said, I think for the sake of this post, I will simply call him Mr. Manly. Mr. Manly is, well, manly. And patient. Let’s just say that pretty much the entire premise of this blog is outside his area of expertise. But he has perfected the fine art of nodding and saying “yes dear” whenever I go off on a tangent about fabric, is incredibly skilled at turning a blind eye to the ever-growing craft area taking over the corner of our living room, and has, on multiple occasions, driven me all over God’s creation to search out a much-needed specialty ingredient for one of my cooking adventures. Most importantly though, he can EAT. 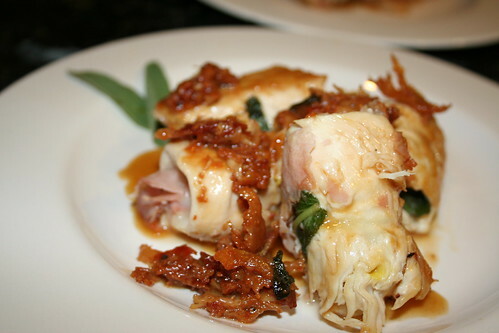 What I love about Chicken Saltimbocca is that it’s one of those meals that is so incredibly quick and easy, yet tastes and looks like something from a restaurant. What I also love is that you don’t really need a recipe; to be honest, I do it differently every time I make it. Sometimes I use thin pieces of chicken, sometimes whole breasts. Sometimes I roll them up, sometimes I leave them flat. Heck, sometimes when I’m feeling particularly lazy, I don’t even bother properly layering anything, and I just throw it all into a pan. 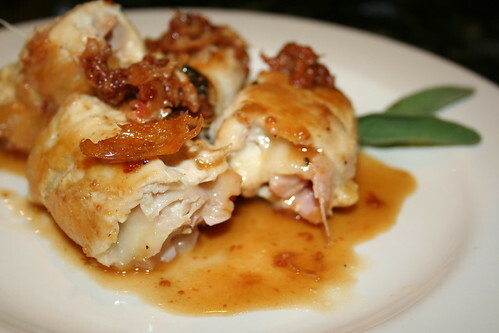 In my book, pretty much any combination of cooked chicken breast, prosciutto, sage, Fontina cheese, and pan sauce can be called “Saltimbocca”. Italian culinary purists will tell you that a true Saltimbocca doesn’t have cheese in it (they’ll also remind you that it should be done with veal and not chicken); many Italian-American cooks will tell you it ought to be breaded. Since we’ve got to start somewhere, though, let’s take a look at a specific iteration I made a little while back, shall we? This particular go round, I started with boneless, skinless chicken breast cutlets. They happened to be on hand. 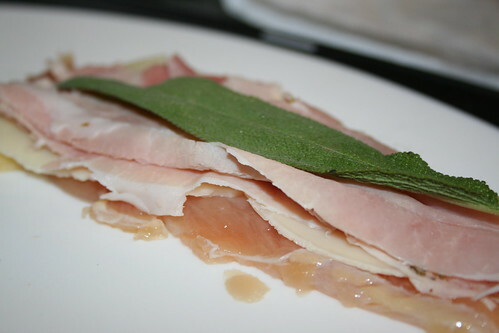 I also happened to have on hand the best prosciutto in the world — the prosciutto cotto from Salumeria Italiana. 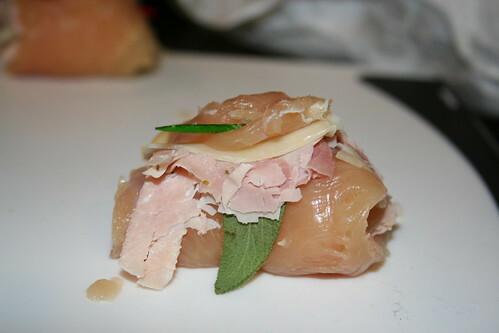 To start, layer each piece of chicken with a slice of Fontina cheese, a slice of prosciutto, and a sage leaf. 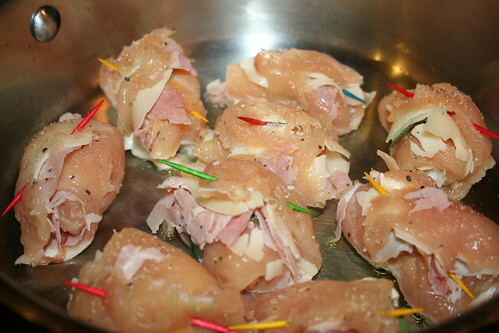 Next, roll the chicken up into a not-so-neat bundle, and secure with a toothpick. Salt and pepper the chicken bundles, then heat a skillet (preferably metal for a nice sear), add some olive oil, and put in your chicken. Cook in batches if needed so as not to overcrowd the pan. 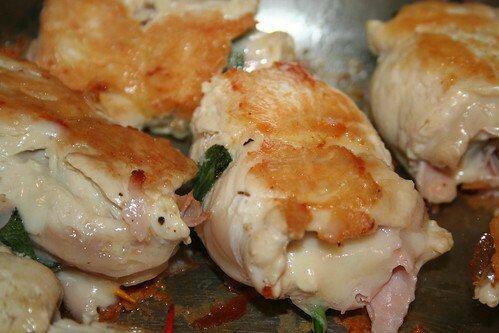 Especially with cutlets, your chicken will cook FAST. As in, just a few minutes per side. By the time you have a nice golden sear all around, the chicken will be cooked through. Note that in the picture above, it is NOT cooked all the way through yet — see the raw area in the piece on the left? Photo was taken just after flipping. Do also note the drool-inducing gob of melted cheese making its way out of the center of the piece on the right, however. Start with a little liquid at first to loosen the bits of meat from the pan, and then add more as it starts to cook down. I like to also add some butter for flavor and a slightly thicker texture. You can also add a little flour or arrowroot starch if you like a thicker sauce. Now, assemble the chicken on a plate, drizzle with sauce, and garnish with a pair of sage leaves. Enjoy! The original recipe I based this on is below; I’m afraid I can’t credit it properly as it was passed on to me by my Mom. You’ll see it is a bit different than what I’ve just described. 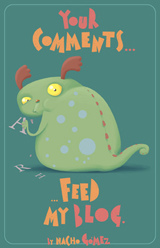 Bottom line, no need to be fussy — just go with it! I think this may be my most hunger-inducing post to date. Luckily for me, it’s time to go make some Birthday ‘Bocca. Slice the tenderloin (small flap of meat) off the chicken breast halves; set aside. Cut each breast on the bias into 3 medallions. Place tenderloins and medallions between two layers of plastic wrap and pound to 1/16″ thick. On each piece, layer a slice of Fontina, half a slice of proscuitto, and a sage leaf; secure by threading a toothpick through the layers. Sprinkle underside of each with salt and pepper. Melt 1 T. butter in a skillet over high heat. Saute half the pieces, chicken side down, until golden, 2-3 minutes. Turn and cook 1 minute more. Remove from pan and keep warm. Repeat with 1 T. butter and remaining chicken. Remove and keep warm. Pour Madeira into skillet and let reduce slightly, about 1 minute. 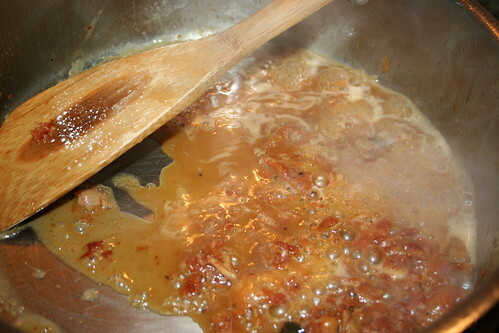 Add remaining 1 T. butter and cook, swirling pan, until sauce thickens, about 30 seconds. Pour sauce over chicken, remove toothpicks, and serve immediately. Notes: I’ve substituted other types of cheese before and it was still good, if different. Likewise, feel free to substitute sherry, Marsala, or white wine for the Madeira. Oh, and one last tip: Unlike the photos above, I’d recommend using non-colored/dyed toothpicks to secure your chicken. Just take my word on this one. can this be made ahead of time for a crowd? Thanks for stopping by! That’s a really good question. I would be a little wary of doing it ahead of time myself, as one of the best parts is the pan sauce that you make right after you cook them up! That said, if you did want to try making it ahead of time, I’d make the rolls (do them in batches as needed) and put the finished ones in a 9×11″ glass pan. Then make the sauce once you’ve cooked all the rolls, and drizzle it evenly across the pan. Cover with tin foil and put in the fridge, then when it’s time to eat, reheat in the oven at 350 until warmed through. Alternatively, what I would probably do myself is to simply assemble the rolls ahead of time, but not cook them up. They cook so quickly that — assuming your crowd is more like 10 people, not 40 — it would still be fairly easy to simply cook up the preassembled rolls and do the pan sauce while hosting. They do cook up fairly quickly, especially if the chicken cutlets are on the thinner side. Let me know if you give it a try — I’d be curious to see how it turns out!